The tropical disturbance in the Central Atlantic has developed into Tropical Depression #2. We'll get the first advisory at 11am. Located ~2500 miles from FL. Beryl has strengthened into as hurricane Friday morning, according to the National Hurricane Center. “Hurricane Beryl's small eye has become apparent in infrared satellite pictures early this morning,” the NHC tweeted Friday. "Beryl has rapidly intensified to a Category 1 hurricane, but the forecast remains the same, to dissipate by early next week," Severe Center Weather 9 meteorologist Rusty McCranie said. 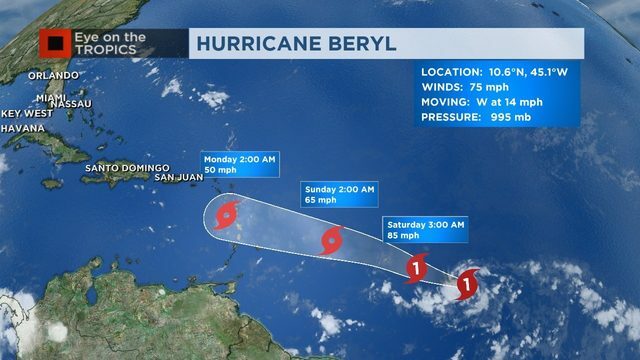 Tropical Storm Beryl, which formed in the central Atlantic Ocean Thursday afternoon, could strengthen in to a Category 1 hurricane by late Friday or early Saturday, Chief Meteorologist Tom Terry said.